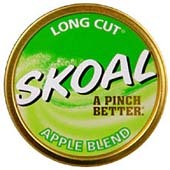 I have two sets of friends: those that know I dip and those that don't. Tobacco is cancerous. I'll spare you the pictures of people who have gone through throat and mouth cancer. It's gruesome - search at your own risk. Friends and family that battle cancer. Last week my grandmother had surgery for mouth cancer; a friend's mother battled lung cancer for months before going home to Jesus. There are more stories, the point is this: it's careless and inconsiderate to use tobacco when people around you fight for their lives against cancer. Nicotine is addictive. It is scary when a $4.00 plastic can determine your demeanor. It's also scary when you track your expenses and see how much money you spend on vices. Lance Armstrong. I've felt indifferent about Lance until I started following him on Twitter. He's dead serious in leading the fight against cancer. I believe him when he says the reason he came back from retirement was to boost LiveStrong awareness and challenge industrialized nations to heavily fund cancer research. His altruism is authentic.